All CTs Are Not the Same! 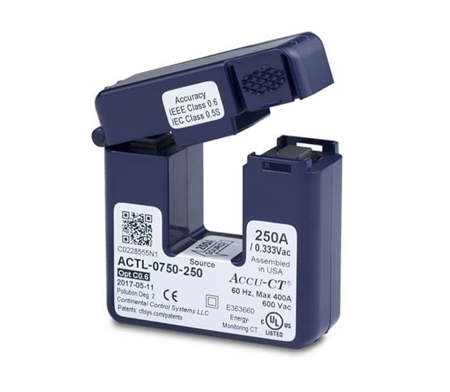 The Accu-CT ACT-1250 series split-core current transformer (CT) offers revenue grade performance with a unique one-handed opening and closing mechanism. 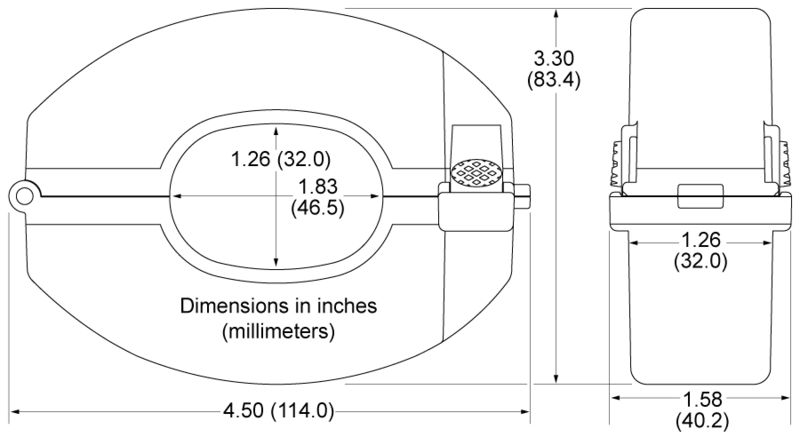 The oval opening can handle a single 750 kcmil (MCM) conductor or two 400 kcmil (MCM) conductors. Best low-end accuracy of any split-core CT! Max Amps is the recommended maximum continuous current. 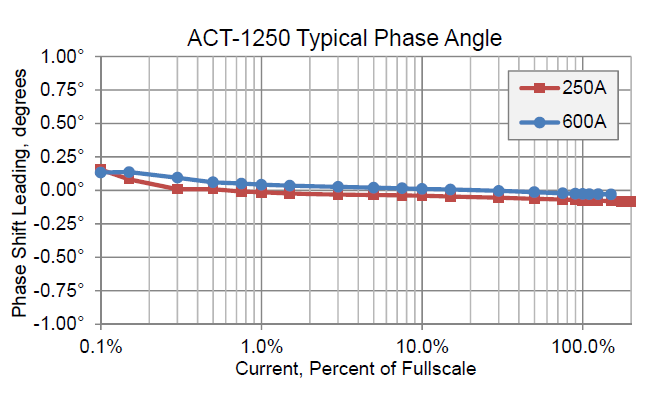 See ACT-1250 Maximum Amps for details. The accuracy specifications apply over the full operating temperature range (-30°C to 55°C) unless otherwise noted. Standard models are calibrated for optimum accuracy at 50-60 Hz. The following accuracy specifications apply to the standard model (no options) or for Option C0.6; the specifications may vary for other options, so see the details on individual options for specifications. Two 350 kcmil THHN conductors. They must be in close contact to both fit. Outdoor Use: Suitable for outdoor use when mounted in a NEMA 3R or 4 (IP 66) rated enclosure, provided the ambient temperature will not exceed 75°C (167°F). Label barcode: QR Code, "Model ; SerialNum"
With Option C0.6, the Accu-CT meets IEEE/ANSI C57.13-2008 class 0.6 accuracy and IEC 60044-1 class 0.5 and class 0.5 S accuracy from -30°C to 55°C and from 1% to 120% of rated primary current (see CT Accuracy Standards). The ACT-1250 series of transformers are not available with a 50 Hz option, because it is not needed. The standard models (including Opt C0.6) meet the accuracy specifications over the full range from 50 to 60 Hz. The Accu-CT can be ordered with custom lead lengths. For example, Opt FT=50 for 50 foot leads. We also sell extra lead wire to allow for field extension of the leads. 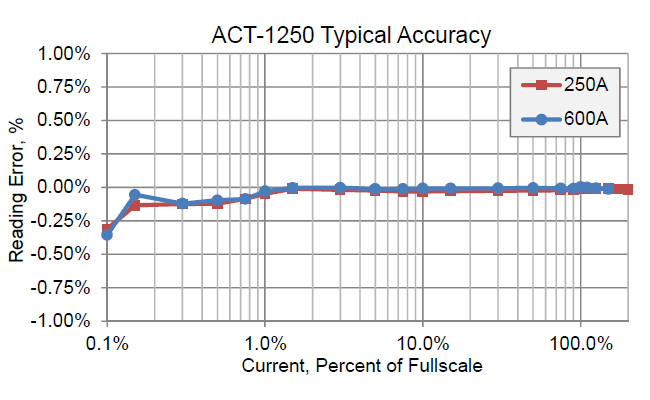 Option FT does not affect the accuracy specifications. 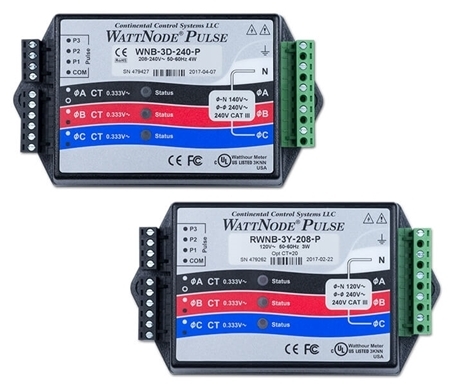 The Accu-CT advanced options are generally not useful when ordering the Accu-CT for use with a WattNode® meter, but may be useful for other applications.